Public schools are increasingly filled with black and Hispanic students, but the children identified as “gifted” in those schools are overwhelmingly white and Asian. The numbers are startling. 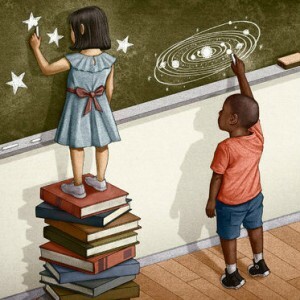 Black third graders are half as likely as whites to be included in programs for the gifted, and the deficit is nearly as large for Hispanics, according to work by two Vanderbilt researchers, Jason Grissom and Christopher Redding. New evidence indicates that schools have contributed to these disparities by underestimating the potential of black and Hispanic children. But that can change: When one large school district in Florida altered how it screened children, the number of black and Hispanic children identified as gifted doubled. That district is Broward County, which includes Fort Lauderdale and has one of the largest and most diverse student populations in the country. More than half of its students are black or Hispanic, and a similar proportion are from low-income families. Yet, as of 10 years ago, just 28 percent of the third graders who were identified as gifted were black or Hispanic. In 2005, in an effort to reduce that disparity, Broward County introduced a universal screening program, requiring that all second graders take a short nonverbal test, with high scorers referred for I.Q. testing. Under the previous system, the district had relied on teachers and parents to make those referrals. The economists David Card of the University of California, Berkeley, and Laura Giuliano of the University of Miami studied the effects of this policy shift. The results were striking.